Welcome To Korea: 4,000 U.S. Troops Arrive At A Tense Time : Parallels In the weeks between North Korea's nuclear test and rocket launch, 4,000 new American troops have arrived in South Korea. They're still adjusting to challenges, both big and small. 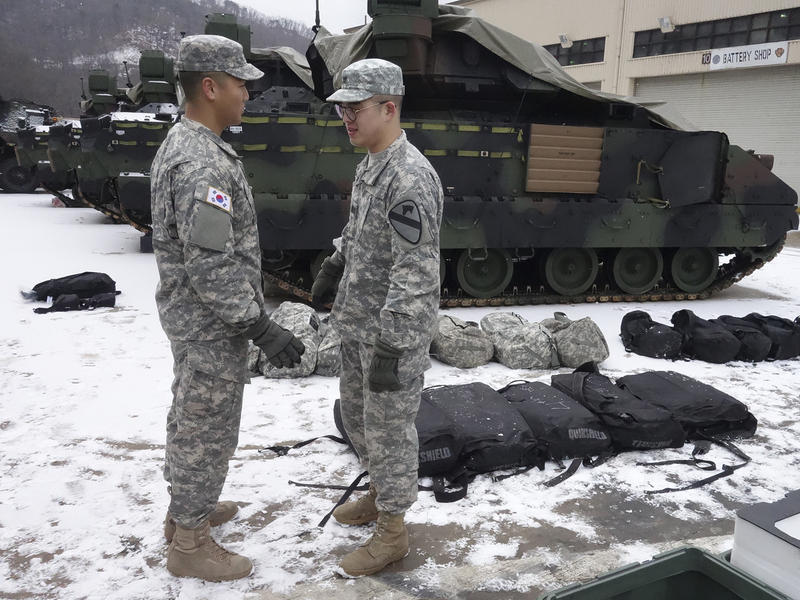 An American soldier (right) from the First Armored "Ironhorse" Brigade of the 1st Calvary Division is among those who began arriving in South Korea in mid-January. They are replacing U.S. troops that cycle out in February. He's speaking with a South Korean soldier who's part of an integrated U.S.-South Korean division. About 4,000 soldiers from Fort Hood, Texas, have landed in South Korea in the past few weeks, to serve along the border of the two Koreas. As policy makers contend with the thorny security challenges of the region, soldiers are adjusting to more day-to-day challenges. Fresh off the planes from central Texas, the men and women of the U.S. Army's 1st Armored Brigade Combat Team say it's the snow that made the most noticeable first impression. "We left Fort Hood at about 60 degrees, 70 degrees. And we got here to about 10 or 15 degrees, which apparently is standard for here," said Spc. Delaney Burks. She's wearing some of her army-issued cold weather gear for the first time. "You're issued actually an eight-layer system in case it gets super-cold," she says. What was once considered a peacekeeping stint, in which a few hundred soldiers rotated in and out each month as their tours came up, has now changed. Last June, for the first time ever, an entire combat-ready brigade of 4,000 deployed to South Korea as one unit. This is the same way troops were sent to the wars in Iraq and Afghanistan. "It's definitely a readiness issue," says Col. Scott Sonsalla, the deputy commander here. He said the decision to deploy to Korea in this manner came from higher levels, but the execution is seen in the preparations for next month's war games with the South Korean army, and how the American troops were trained. "The first thing they did when they came off the plane was they grabbed their bags and repacked them to a combat load," Sonsalla says. "You see it once, twice a year, where there is some sort of friction between the North and South. If you look at the motto that we've always had here, it's 'fight tonight.'" Talk to the soldiers expected to pick up and "fight tonight," and they seem more preoccupied with the frigid temperatures than with the regime of Kim Jong Un. "We're doing a lot of cold-weather training, just making sure people are prepared for the cold-weather injuries," says Spc. Jordan Tauber, a medic who arrived about three weeks ago. The frigid temperatures haven't stopped regular move-in routines like "layouts," army-speak for taking inventory. "We're laying out some of our rope climbing kits, our explosive blankets to help cover you during a blast, things like that," says Staff Sgt. Brad Sheets. He is among those moving in, replacing the 4,000 heading home. There are also cultural adjustments. The Army dining hall where we found Tauber is the same as it would be anywhere else in the world — with one key exception. "They do have a kimchi bar here, and some seaweed with some rice and things like that to add to your meal," Tauber says. On top of the cold, troops are getting used to Korea's spicy, fermented favorite dish. 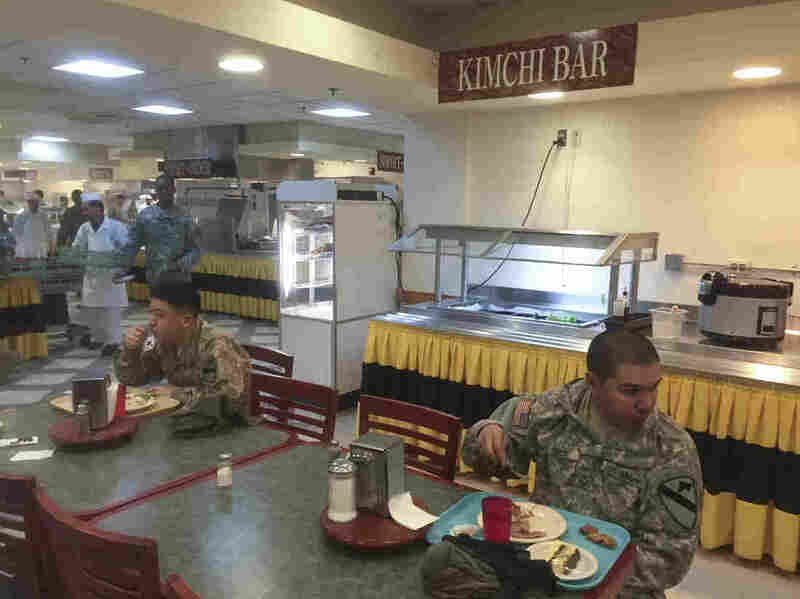 "It's cool seeing a lot of my battle buddies try new foods, especially kimchi, because it freaks them all out," says Tauber. What can scare an American soldier stationed in Korea isn't always the most obvious thing.